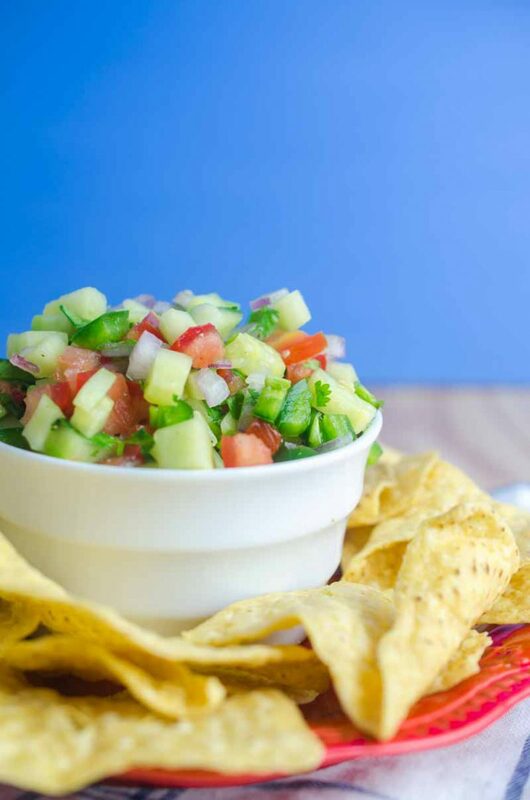 Cucumber Salsa is quick easy and will be your new favorite way to use cucumbers. Only 6 ingredients: cucumbers, lime, tomatoes, cilantro, onion & jalapeño. This post is sponsored by Mission®. We are grateful for our sponsors as they allow us to bring you delicious, free content every week. As always, all opinions are my own. The Fourth of July will be here before we know it. That means it’s time to start planning the menu for the big gathering. 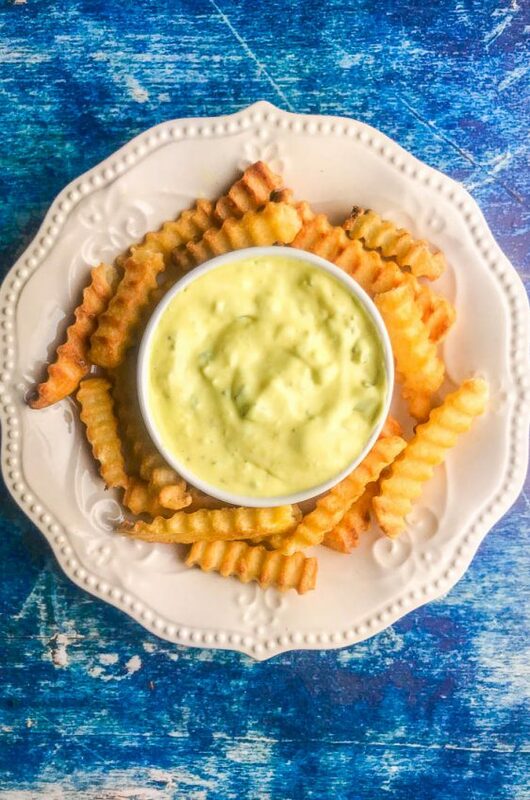 Whether you cook out in your backyard, head to the beach or go camping in the mountains, I am guessing that chips and dip is going to be the one staple that every Fourth of July party will have. 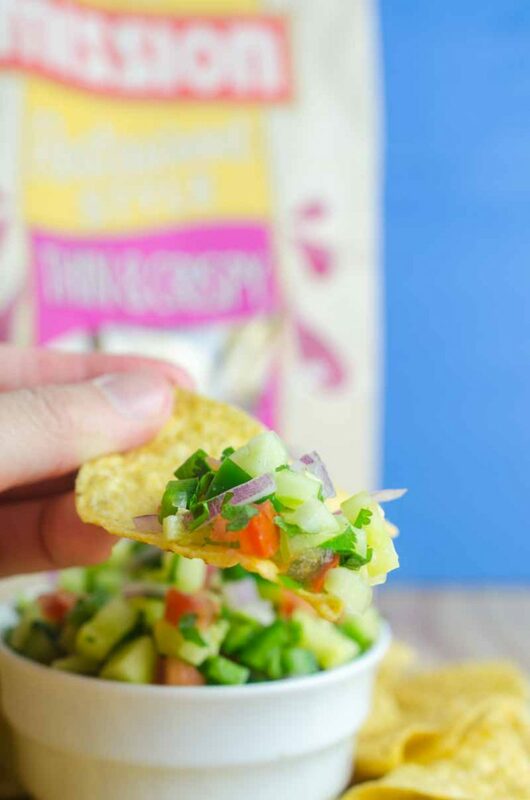 Today I am teaming up with Mission to bring you this recipe for Cucumber Salsa that pairs perfectly with Mission® Thin & Crispy Tortilla Chips. 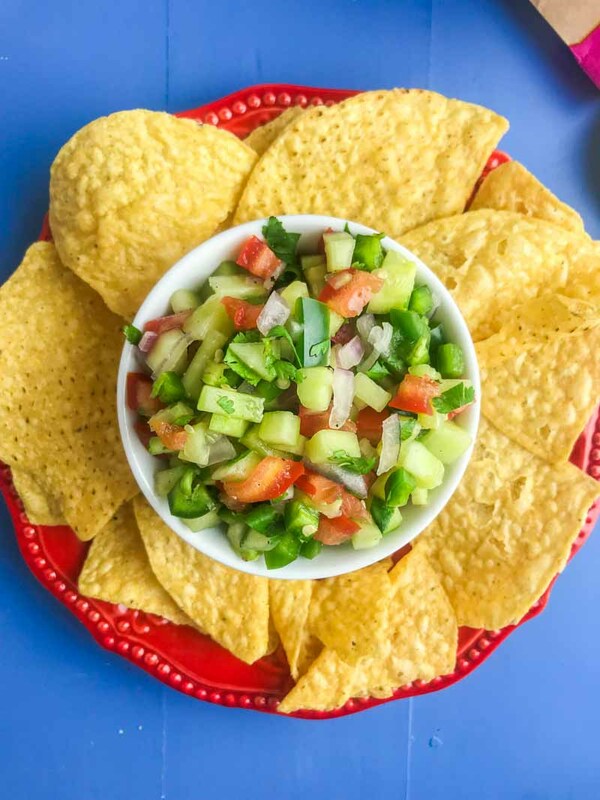 Full of fresh cucumbers, tomatoes, onions, jalapeño and cilantro, this light refreshing dip will be perfect for your Fourth of July party spread. Is it just me or is hanging out by the chips and dip area the thing to do at parties? It has always been that way at my home. 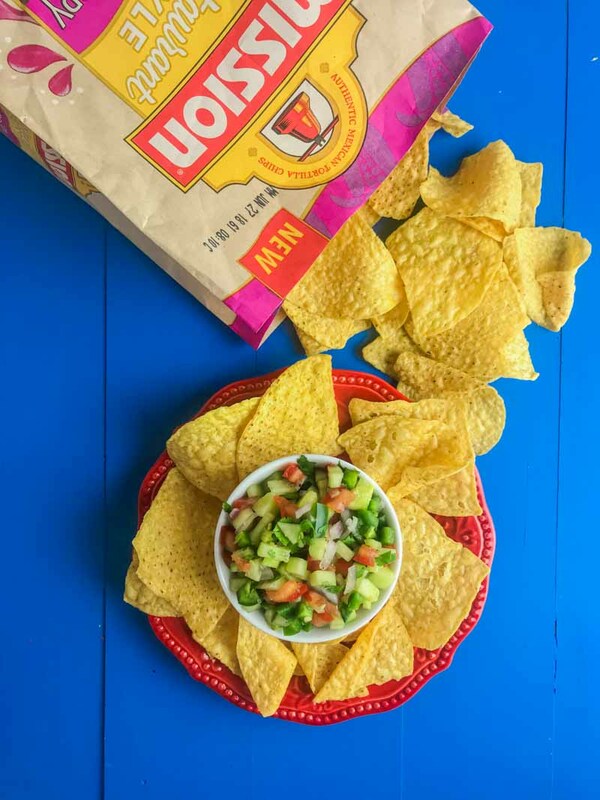 We break out chips and dip during football games in the fall, during movie days in the winter and of course at every Fourth of July BBQ. 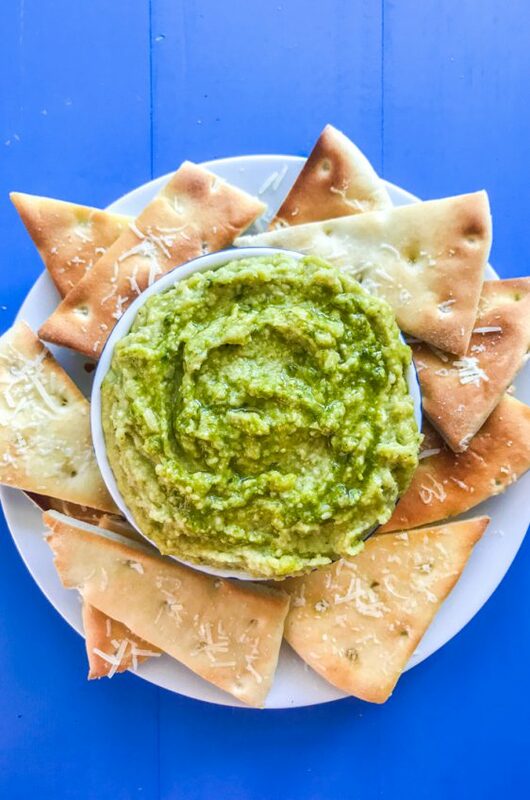 Nothing beats hanging out with your family and friends around a picnic table waiting for the fireworks to start while you snack on chips and your favorite dip. I have been a fan of Mission Tortilla Chips since childhood. My dad would always buy a bag of them and our favorite habanero salsa (we like things spicy!) and snack while watching movies together. And to this day, I still make sure to have a bag in my pantry at all times. I use them for nachos, for snacking on my favorite guacamole, or for dippers for ceviche. 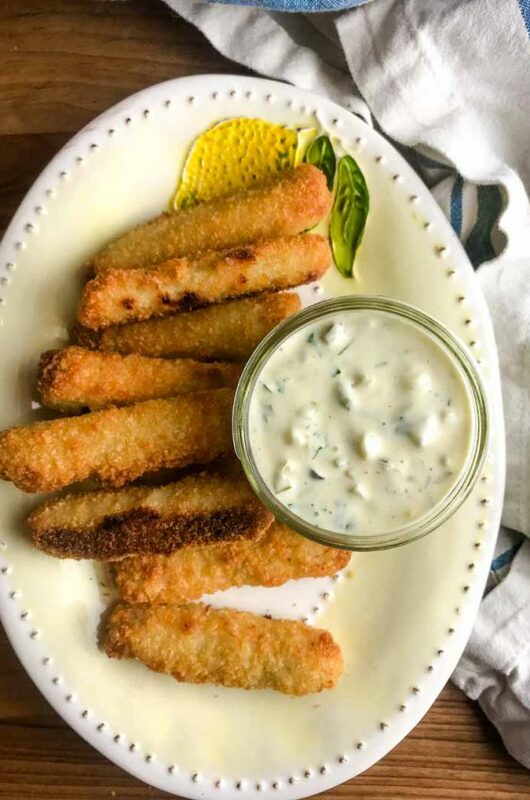 When it comes to chip snacking, I am a huge fan of thin and crispy chips. I like the lightness and the crunch that comes with them. 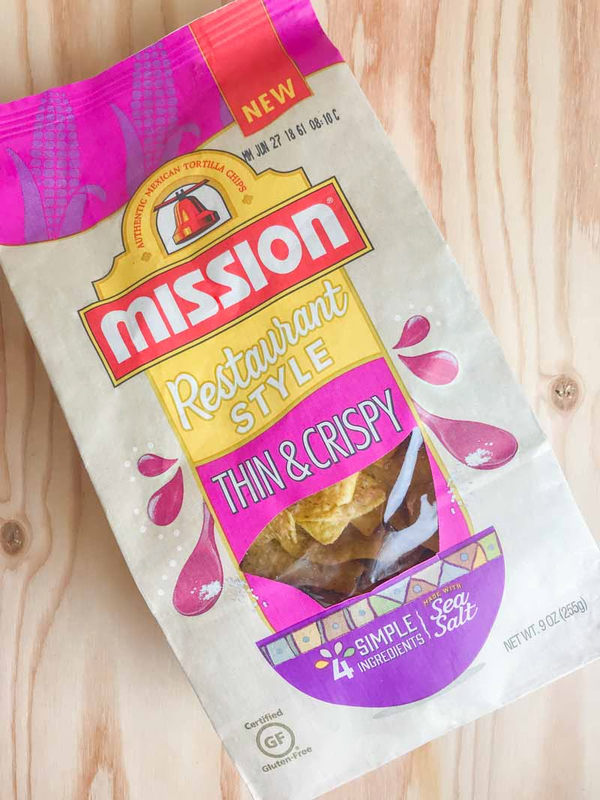 The new Mission Thin & Crispy Tortilla Chips are everything that the name says. 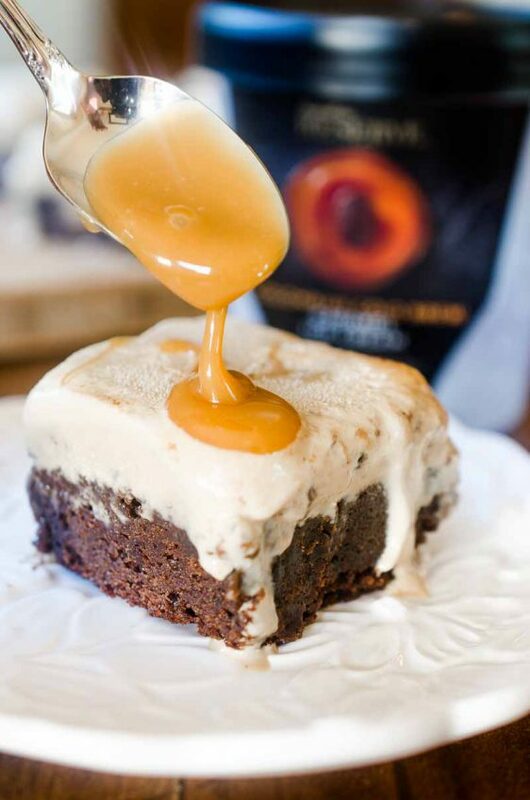 And with only four simple ingredients (whole grain corn, water, oil and sea salt) they are also certified gluten free. You can find out where these chips are sold using the store locator on this Mission Chips site. 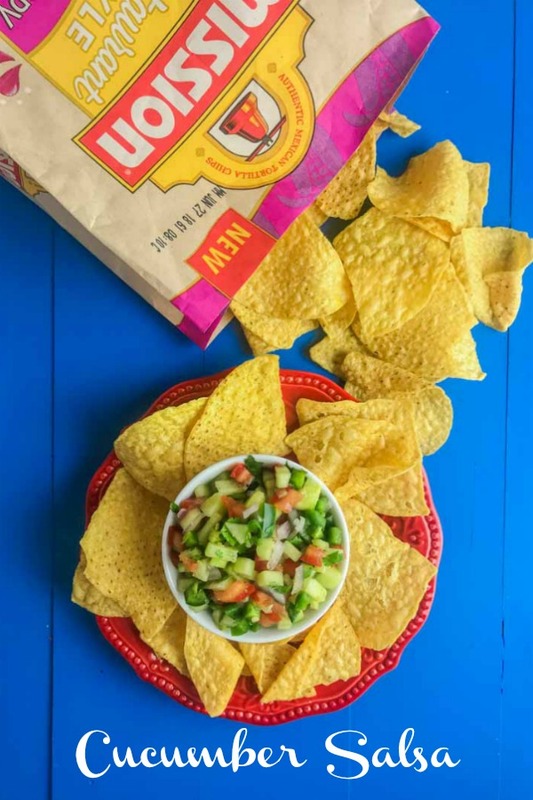 The chips are so crispy that they are a great snack on their own but are also a perfect dipper for a light summer salsa. Speaking of summer. 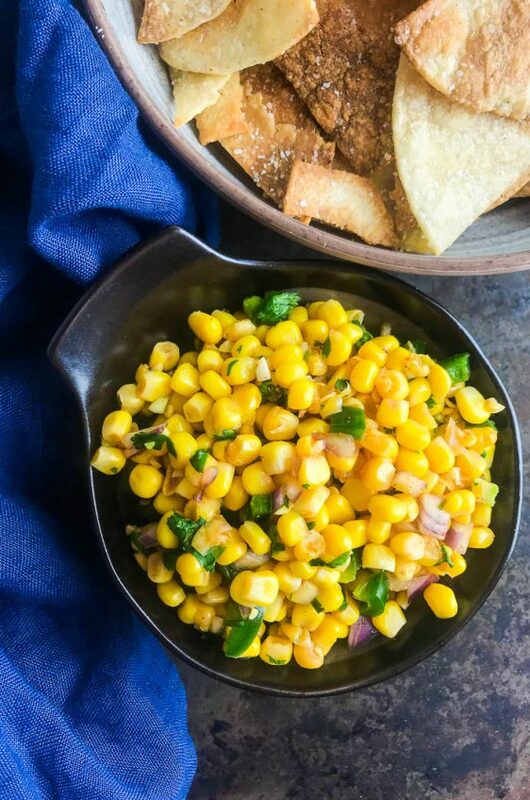 What is better than making a salsa with ingredients from your summer garden? Around here summer gardens = summer cucumbers. Lots of cucumbers. And you know what my new favorite way to use cucumbers is? Making Cucumber Salsa. Cucumber Salsa is so quick and so easy to make. Cucumbers, red onion, tomatoes, cilantro, lime juice and salt and pepper are what you need. Because I like things a little on the spicier side, I also added a fresh jalapeño to the mix. If you want only a little heat I recommend taking out the seeds of the jalapeño. Or if you want no heat at all, feel free to leave the whole thing out. The hardest part about making this Cucumber Salsa is that you have to give it 20 minutes to let the flavors mingle. Trust me though, it is so worth it. 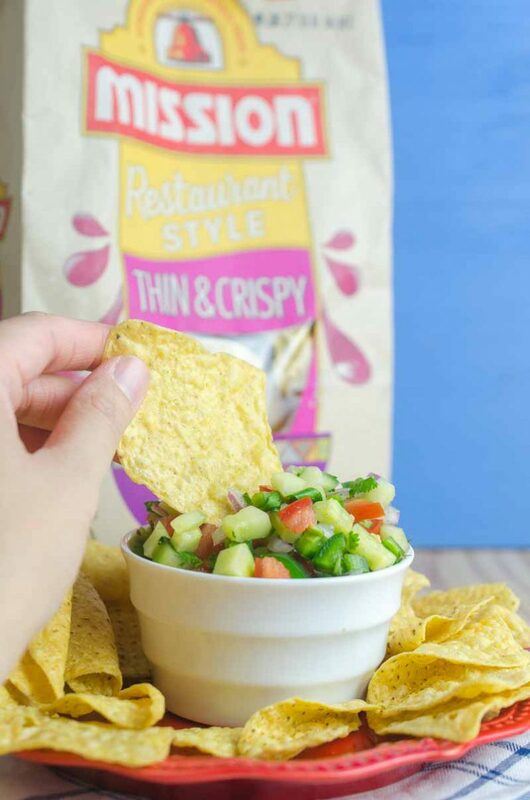 Plus, while you’re waiting you can still get your snacking on by noshing on tasty Mission Thin & Crispy Tortilla Chips all on their own. Combine cucumber, tomato, red onion, jalapeño, cilantro, lime juice, salt and pepper together in a bowl. Mix well. Cover and refrigerate for at least 20 minutes. 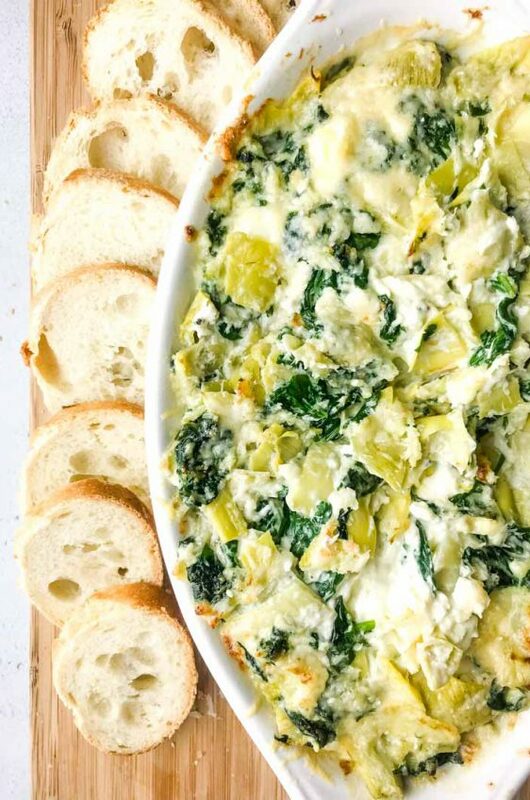 Serve with Mission® Thin & Crispy Tortilla Chips. I love this cool cucumber take on salsa! I love the sound of cucumber salsa! It looks so refreshing! I must try these chips with this salsa! Love this idea, sometimes tomatoes get boring! !